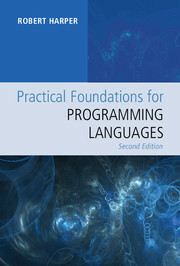 Practical Foundations for Programming Languages (Second Edition) by Robert Harper. My purpose in writing this book is to establish a comprehensive framework for formulating and analyzing a broad range of ideas in programming languages. If language design and programming methodology are to advance from a trade-craft to a rigorous discipline, it is essential that we first get the definitions right. Then, and only then, can there be meaningful analysis and consolidation of ideas. My hope is that I have helped to build such a foundation. Abridged preview edition, with corrections. Size of a Lambda Term, Revisited. Dynamic Dispatch as an Abstract Type. Recursive Types are not Inductive or Coinductive Types. Relating Transition and Cost Dynamics for Parallel PCF. How to (Re)Invent Tait's Method. How to (Re)Invent Girard's Method. List of known mistakes, and their corrections. Commentary on choices, variations, and extensions. Principles of Programming Languages. Carnegie Mellon University undergraduate course in programming languages. Existential Type Blog. Writings on programming languages, research, and education. Notation Guide provided by Toronto CS Reading Group.